Birthday card maker software create your own style of birthday cards to present to the special people in your life on their most special day which comes only once in a year. Birthdays are the great occasions when you can express the depth of feelings and well wishes that you do have for someone. So celebrate this awesome day in your own customized way by crafting your imagination into birthday wishing cards that will really be admired and cherished by anyone gifted to. 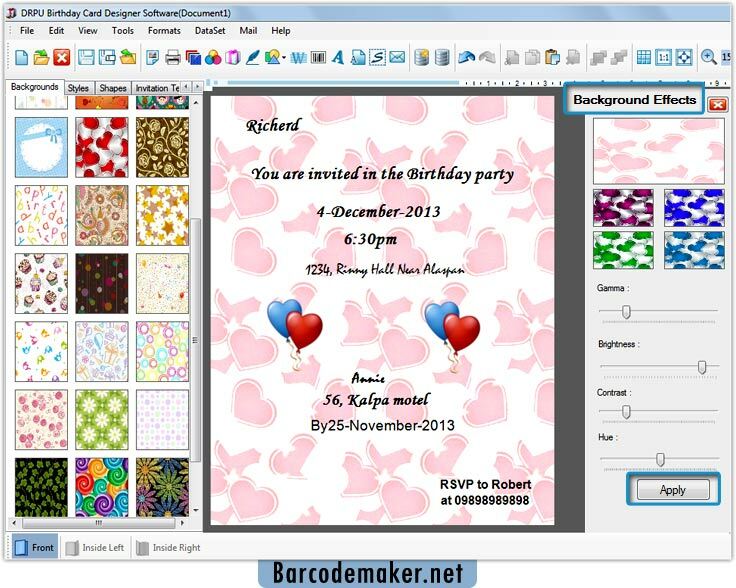 Birthday card maker software is devised with advanced font, color and various image setting features which help to choose among a number of options to build home-made birthday cards. Image designing objects like Pencil, Text, Line, Picture, Ellipse, Rectangle, etc provides users a helping hand to create attractive cards. You can easily add your favorite photo, text or also attach a personal message expressing your hearty birthday wishes in wonderful words. ➀ Quick designing facility tools. ➁ Bulk cards can be created. ➂ Diverse shapes of cards. ➃ Create new or modify existing. ➄ Append photos, text and many more. ➅ Offers flexible print options.